The model SC64 is a temperature controller for simple thermostat applications. It features simple operation and a high switch rating. 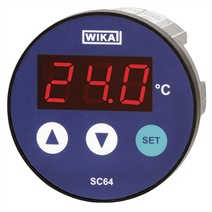 Its round case enables the instrument also to be used in applications where mechanical controllers were used so far. In addition, the SC64 can handle significantly more switching cycles.